Champaign, IL, June 25, 2018 – The Community Foundation of East Central Illinois and United Way of Champaign County continue to improve the quality of life for residents of east central Illinois. The organizations awarded a combined $24,185 in grant funding to Promise Healthcare for their Urbana School-Based Health Center. The funding, $11,685 from the Community Foundation and $12,500 from United Way, will help cover equipment and programming expenses for the Health Center located at 1002 S. Race Street, adjacent to Urbana High School. 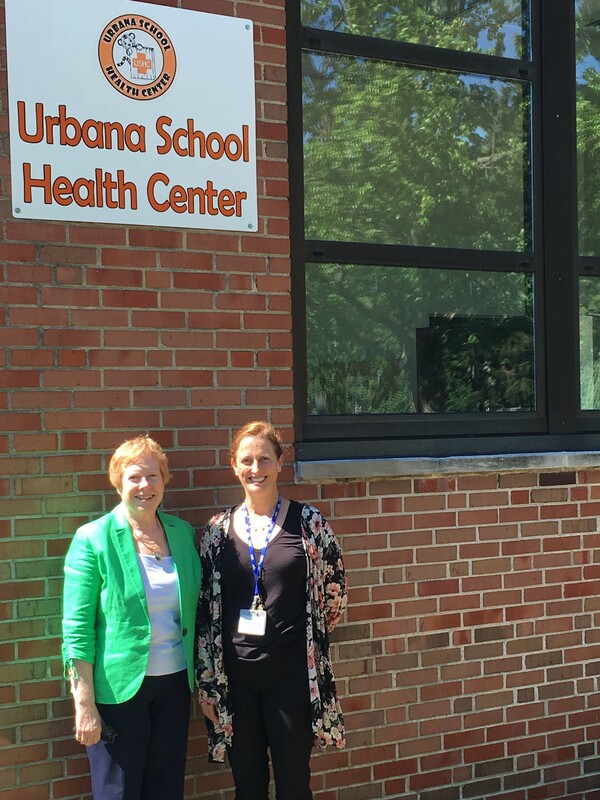 The Urbana School-Based Health Center is a clinic that offers primary medical and behavioral health services to children in the Urbana School District regardless of their ability to pay. Promise Healthcare will begin operating the existing medical and behavioral health services July 1. The clinic hopes to serve 900 patients each year through this location. Promise Healthcare, whose programs include Frances Nelson and SmileHealthy, was one of the first organizations to receive grant funding from the Community Foundation of East Central Illinois. Since 1974, the Community Foundation has provided nearly $150,000 in support to this organization dedicated to improving the health of the community through treatment, prevention and education. The Community Foundation was one of the original investors in the school-based center in 2004. United Way has also been a long-time supporter of Promise Healthcare, providing $481,000 in grants over the years. Established in 1972, the Community Foundation of East Central Illinois has distributed nearly $17 million in charitable grants to over 400 nonprofit organizations working to improve the quality of life in communities throughout the area. These charitable distributions include designated and undesignated gifts from endowments, field of interest funds, donor-advised funds and scholarships. The Community Foundation stewards more than 120 funds and its total assets have grown from $1,300 in 1972 to more than $27 million today. Administering additional grant dollars on behalf of the Marajen Stevick Foundation and in collaboration with the Lumpkin Family Foundation, the Community Foundation distributes nearly $1 million annually to nonprofit organizations providing vital services and enrichment to residents. For more information about the Community Foundation of East Central Illinois, visit our website at www.cfeci.org or find us on Facebook (CFECI). Founded in 1923-24, United Way of Champaign County’s mission is to bring people and resources together to create positive change and lasting impact in our community. UWCC focuses on funding programs and initiatives that improve the Building Blocks for a Good Life: Education, Health and Financial Stability. UWCC distributes nearly $3 million each year, making it the largest nongovernmental funder of social service programs in the county. For more information, visit www.uwayhelps.org. Promise Healthcare is dedicated to improving the health of the community through treatment, prevention and education. Promise Healthcare provides over 44,000 visits and cares for over 12,000 patients each year through Frances Nelson, the SmileHealthy dental programs, satellites on Walnut at Rosecrance and the OSF Healthcare Heart of Mary Community Resource Center and mobile clinics. Promise Healthcare provides primary medical, behavioral health and dental care to those who might otherwise go without these services.